Pop-ups on this map display information about the city’s bridges that was collected during the bridge inventory. Just outside Washington, DC, in an office in the public works department of the City of Falls Church, Virginia, sits the city’s lone GIS employee. Although Andrew Peters is only one individual, he has used GIS to improve workflows throughout the entire city—namely, by turning to the Esri technology his organization already had. Rather than spend weeks developing apps from scratch, Peters rolls some out in less than a day. Using the ArcGIS platform—including ArcGIS Pro, ArcGIS Online, Web AppBuilder for ArcGIS, and the ready-to-use map and app templates available on the ArcGIS Solutions website—he can deliver the focused apps that city staff need for inventorying trees, inspecting bridges, and more. When Peters came on staff as GIS manager in late 2016, he immediately began to look for ways he and the city could use GIS to become more efficient. Only one staff member, a planner, was using GIS—making development maps for city council meetings. Peters wanted to get more users on board. Fortunately, his GIS predecessors had set up the city’s ArcGIS platform, including an ArcGIS Online organizational account. They had collected a lot of great data and, by adding public works project and land data, kept the file geodatabase current. But making changes one by one in the file-based system was too time-consuming. Peters realized that if he was to keep up with the demands of a changing city, as well as put that great data to work for staff and citizens, he needed a system that could accommodate many users simultaneously. To do that, he would need to convert the file geodatabase to an enterprise geodatabase. Peters took online Esri courses, worked with his account representative, and talked with a solutions engineer—and with all that guidance, he created an enterprise geodatabase that would be easier to manage, accessible to other users, and able to support different city workflows. City staff use a mobile app to gather and update bridge data. Once Peters began converting the city’s datasets to the enterprise system, he wanted to put the data to work right away. So he began using two methods to create and deliver apps: Web AppBuilder for ArcGIS, an app-building environment inside ArcGIS Online that requires no coding, and ArcGIS Solutions. The idea was to create mobile apps so people could access and interact with data in a way that helped them complete tasks. Most of the city’s geographic data layers were already in ArcGIS Online and served out through an open data website so that people could access web maps on their mobile devices. But Peters wanted to make the maps more valuable by adding interactive functionality. For example, Peters decided to tweak the county’s tree inventory app. Web AppBuilder for ArcGIS walked him through tasks for adding a web map, location widgets, search capabilities, and work order configurations. He gave the app extent capabilities that show users more data layers as they zoom in to the map. He then saved his work and launched the preview before deploying it in ArcGIS Online. The entire process took about a week. In comparison, VDC Research Group, Inc., a technology market research firm, reports that, on average, organizations require more than six months to develop and deploy a single mobile app while spending, on average, $140,000 for it. VDC also found that 36 percent of organizations were dissatisfied with the speed at which they were adopting mobile apps. Why should Peters waste time reinventing an app when so many cities are doing nearly the same work and using pretty much the same GIS workflows? Working with industry experts, Esri curates a collection of industry-specific solutions that include ready-made maps and apps to help local governments quickly get the GIS technology they already have up and running. In the ArcGIS for Local Government suite, for instance, Esri offers solutions just for public works. It has 12 configurable workflow apps, ranging from public road network maintenance to facilities and grounds maintenance. From among the ArcGIS government solutions, Peters selected ready-made apps for tax assessment, snow removal, streetlight inventory, sanitary storm water conveyance, and bridge inventory. The configurable solutions include map documents for publishing field-collected data, as well as the state government geodatabase with sample data. Esri users have access to more than 100 solutions for free. If a GIS manager selects the Streetlight Inventory solution, for example, he or she can see that it helps state departments of transportation develop a comprehensive inventory of streetlights and poles and prepares the information for maintenance workflows. 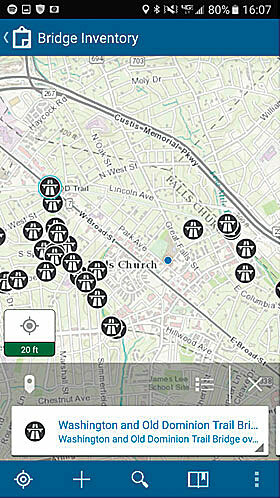 The mobile app has a toolbar and predefined methods to automatically populate attributes, such as pole identifiers. It comes with a map document for computing facility identifiers and associated signs, as well as where signals and streetlights connect to their respective poles. The web app also includes two map documents—one to publish the poles service and another to publish the streetlights service. And it incorporates the state government geodatabase with sample data. Using the latest tools in ArcGIS Pro, which is included with ArcGIS Desktop, Peters has been churning out GIS web apps and putting them into the hands of city workers to help them meet their departments’ missions. With the ArcGIS Solutions Deployment Tool—an ArcGIS Pro add-in available from the ArcGIS Solutions collection—he can configure and deploy an app in less than a day. One of the first apps he rolled out using the ArcGIS Solutions Deployment Tool was for completing a bridge inventory, a task that most public works departments across the country know well. The Federal Highway Administration mandates that each state inspect its public highway bridges in accordance with the National Bridge Inspection Standards. 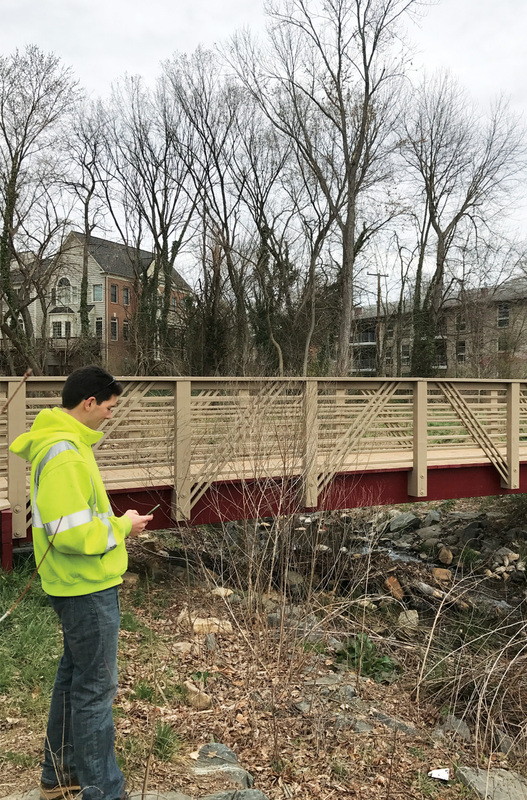 The Virginia Department of Transportation (VDOT) delegates bridge inspection duties to localities, meaning that the City of Falls Church inspects state and federal bridges, as well as its own city-maintained bridges, using these standards. The city inspects most bridges listed in the National Bridge Inventory on a two-year cycle, and those in poor condition more frequently. In addition, Falls Church inspects its own bridges on varying cycles, based on current condition, usually every two or four years. The inventory helps VDOT address bridge deterioration, damage, and other concerns. If a bridge presents safety concerns, VDOT posts weight limits, detours traffic, and repairs these structures. To help contractors and city staff gather and update bridge data more easily, Peters created a mobile app that contains tools for collecting identification information, bridge type, and design data and is aligned with the federal standards for bridge inspections. In ArcGIS Pro, all Peters did was click Deploy an ArcGIS Solution to see Esri’s state government group of ready-to-use apps. From this list, he selected Bridge Inventory and clicked Deploy. 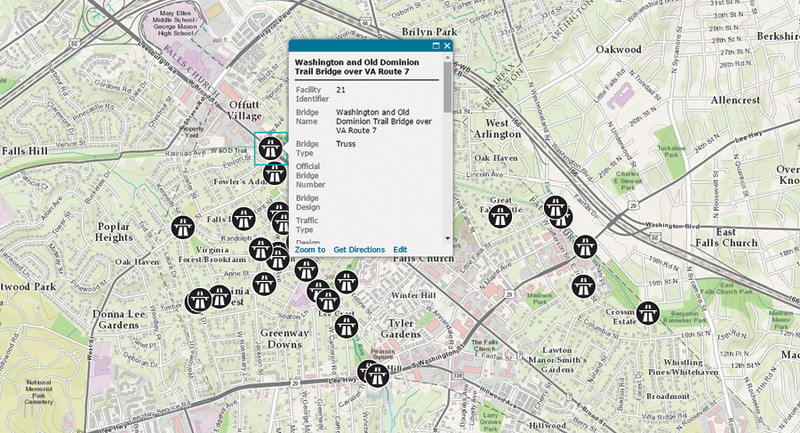 The ArcGIS Solutions Deployment Tool automatically consumed the city’s previous bridge inventory map in ArcGIS Online and made it accessible via Collector for ArcGIS, a mobile app that field staff use to gather information. The ArcGIS Solutions Deployment Tool also added a bridge inventory layer to the city’s files that are hosted in ArcGIS Online and pushed the collected bridge information data to the file. The final step was to click the Finish button. In just four clicks, Peters selected an app, set up a hosted map and layer, and deployed it as a mobile app. The app was immediately ready for workers to access and put to work via their Android smartphones. Technology should help cities work better—more intelligently, more efficiently, and with greater accuracy. If it does not, management needs to rethink it. New technology can be expensive, especially for small towns on tight budgets. But the GIS technology that cities already have may not be so much outdated as it is underutilized. The fact is that most US cities already have a GIS that has the potential to streamline workflows and deliver decision-making intelligence throughout the community. Most cities are just not tapping that potential. City managers must actively look for opportunities to improve processes using the technology they already have while being open to enhancements such as an online subscription, add-on tools, and ready-made maps. 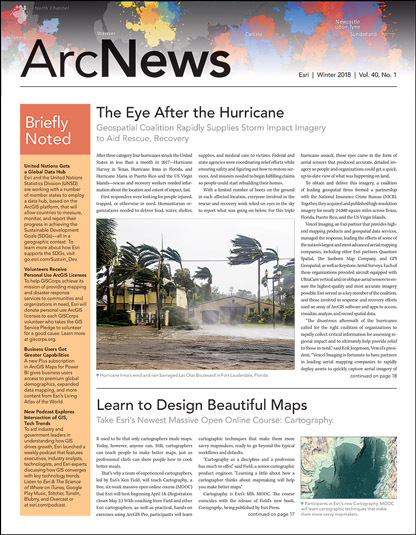 A good place to look first is the ArcGIS for Local Government suite.